A rough guide is that if you are a stationary high power (10W) mobile you should gain access at full quieting around “S2” at the extent of the Dark Blue coverage. Mobile coverage with reasonable copy with 10W would be the light blue band. Handheld access would begin in the light blue coverage zone outdoors but would be patchy indoors. It wouldnt be solid until the green zone. 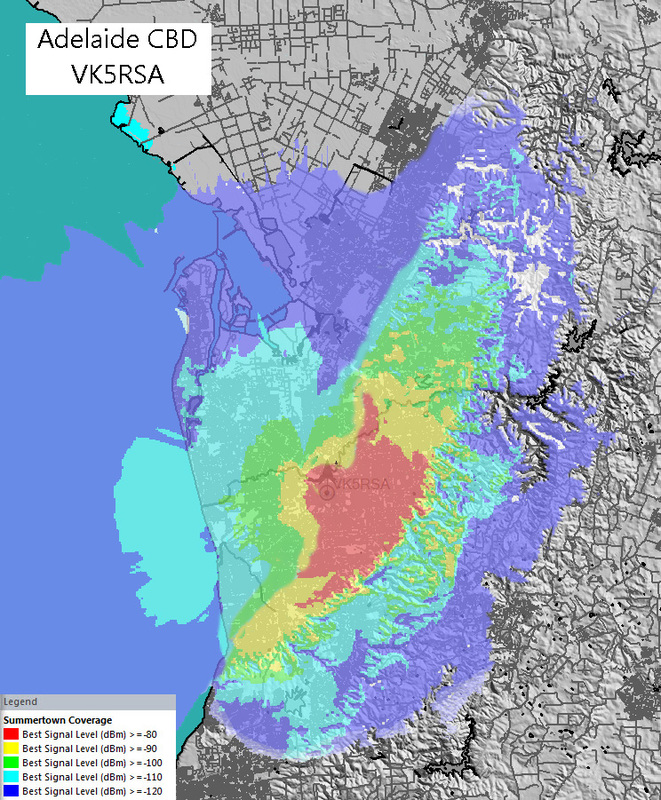 Note: VK5RSA’s coverage is badly limited to the west and north due to the clutter from the surrounding hi-rise buildings in the CBD. This map is a composite of two predictions, one showing coverge without the clutter and one with it imposed in the affected directions. The accuracy of this prediction is therefore not as good as the others you see on this site, but instead should only be considered a guide.